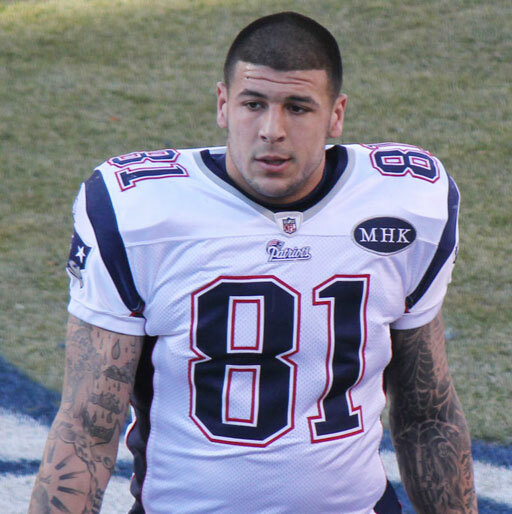 The Randy Report: Aaron Hernandez' Gay Lover Comes Forward: "We Didn't Want People To Know"
Aaron Hernandez' Gay Lover Comes Forward: "We Didn't Want People To Know"
In April of 2017, former NFL player Aaron Hernandez committed suicide while incarcerated at Souza Baranowski Correctional Center in Massachusetts. The 27-year-old was serving time after having been found guilty of the murder of Odin Lloyd in 2013. In the aftermath of his death, scores of news stories explored possible reasons why the former New England Patriots player would take his own life. Now, Hernandez’s boyhood friend, Dennis SanSoucie, has come forward claiming to be Hernandez’s on-again/off-again gay lover. Speaking to the Boston Globe, SanSoucie says the relationship began in middle school and continued through high school. During their time in high school, the two became a power duo on the football field with SanSoucie as quarterback and Hernandez as receiver. In their junior year of high school, SanSoucie connected with Hernandez for 67 passes for a total of 1,807 yards, a Connecticut high school record. But SanSoucie tells the Globe that there was a completely different, secret life the two led outside of football. SanSoucie shares that they would get high on marijuana often - before school, before football practice and before games. It was during this time the two began a physical relationship as well, keeping the secret between themselves. SanSoucie says that growing up in the traditional, conservative community of Bristol, the idea of being openly gay would not have played well. SanSoucie was heading into the military after graduation and Hernandez was bound for football glory. He recalls Aaron coming home one day and announcing he wanted to be a cheerleader. The dad shut that idea down quick, according to Jonathan. The Globe also reports that both Jonathan Hernandez and George Leontire (Aaron Hernandez’s former lawyer) say that Aaron had hinted at having been the victim of sexual abuse as a child. But neither identify who that person would have been. Now out and living in Las Vegas, SanSoucie says he believes Aaron would be proud of him for coming forward now. “I really truly feel in my heart I got the thumbs-up from him,” he said.